Liam Coen has come a long way from working at Sachuest Beach in Middletown. The former La Salle Academy and University of Massachusetts quarterback recently landed a job with the Los Angeles Rams under wunderkind coach Sean McVay. Coen will be the assistant wide receivers coach with the NFC West champions, his first coaching position in the NFL. 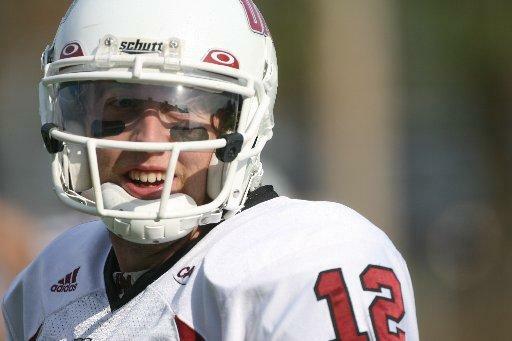 Coen, 32, had dreams of finding an NFL roster spot coming out of UMass. When that didn’t materialize, he went into coaching, but not before spending two summers working at Sachuest Beach, where his father, Tim Coen, was the beach manager. Eventually, Liam Coen caught on with the staff at his alma mater and served as the offensive coordinator at the University of Maine for the 2016-17 seasons. In December, he was named the offensive coordinator at The College of Holy Cross in Worcester, Massachusetts, before the Rams came calling. Tim Coen, who is a former coach at Salve Regina University and Portsmouth High School, shared his son’s enthusiasm. Liam Coen got connected with the Rams through Shane Waldron, who served on the UMass staff alongside Coen. Waldron eventually got a job with the Washington Redskins, and when McVay went to the Rams, Waldron was brought along. He reached out to Coen to gauge his interest in working in the NFL. Coen said he feels bad about leaving Holy Cross – where former Salve Regina University coach Bob Chesney is the head coach – just a few months after accepting the position, but he knew this was an opportunity too good to pass up. “It’s a tough blow to any program who loses their offensive coordinator, and I felt guilty for that, but this isn’t something that comes along very often,” he said. The Rams were the surprise team in the NFL last season, winning their division before falling to the Atlanta Falcons in the wild-card round of the playoffs. Quarterback Jared Goff had a breakout year in his second season, throwing to the likes of Sammy Watkins, Robert Woods and Cooper Kupp. Everything will be done under the 32-year-old McVay, who went 11-5 in his first season with the Rams. Later this week, Coen will be speaking at the Big New England Football Clinic at the Newport Marriott. Then on Sunday, he’s flying out to Los Angeles. “I’m going from one Newport beach to the other,” he said with a laugh.